Clare Balding is replacing John Inverdale as the host of the BBC's Wimbledon highlights show. The move comes two years after Inverdale was accused of making sexist comments about women's champion Marion Bartoli. Almost 700 people complained when he suggested the French player was "never going to be a looker". Although Inverdale will remain as a commentator, Balding will present a new highlights show, called Wimbleon 2Day. 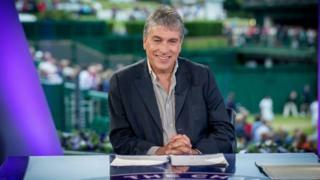 In a statement, the BBC said: "John Inverdale will take up a new role on TV commentary duties at this year's championship and we are looking forward to having him as part of the team. "The introduction of Wimbledon 2Day, presented by Clare Balding, will provide a fresh new look for the highlights show and continue to develop the 'today at the games' brand which Clare presented at both the Sochi Winter Olympics and Commonwealth Games in Glasgow in 2014." Inverdale got into trouble in 2013, when he asked his guest Lindsay Davenport about Bartoli: "I just wonder if her dad did say to her when she was 12, 13, 14 maybe: 'Listen, you are never going to be, you know, a looker. "'You are never going to be somebody like a Sharapova, you're never going to be 5ft 11in, you're never going to be somebody with long legs, so you have to compensate for that. You are going to have to be the most dogged, determined fighter that anyone has ever seen on the tennis court if you are going to make it,' and she kind of is." The BBC later apologised for the "insensitive" comments. Inverdale put the gaffe down to feeling unwell, and said he was "horrified" for Bartoli. She never took offence at the comments, telling the Radio Times: "In my mind it was never really a story. "I'd known John a long time, and I knew what he was trying to say. Everyone starts with their own assets, not everyone is born the same way, but the point is that in sport - in life in general - the message is, if you have determination you can still make it happen." Inverdale continues to front ITV's tennis coverage, where Bartoli is one of his co-presenters.